Hines and the Peterson Group have jointly welcomed the decision by An Bord Pleanála to grant planning permission for the visionary Central Plaza project in the heart of Dublin City Centre. 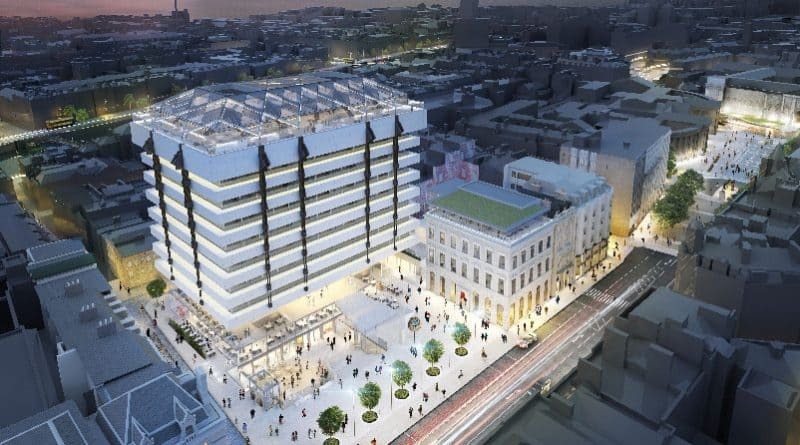 As part of the sensitive restoration of the building’s interior that is already well underway, the iconic former Central Bank Headquarters on Dame Street will provide 73,100 sq. ft of commercial office space across eight floors that will comprise open plan and breakout meeting spaces, incorporating LEED Gold standard, WiredScore Platinum and BER A3, to create a modern environment that will be a highly desirable place to work. The building’s impressive 6-meter-high entrance lobby will be accessible via a grand staircase accessed from the plaza to a stunning 15-metre wide glazed facade with double-height revolving doors. 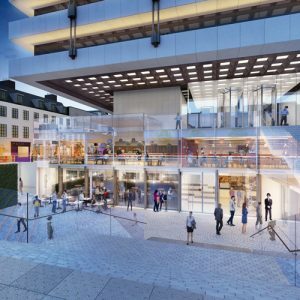 Once completed, Central Plaza is expected to become one of the most vibrant and dynamic areas in the city centre with the creation of 33,000 sq. ft of retail, restaurants and cafés at street and basement level. The existing plaza is also being expanded to create a dynamic new streetscape towards College Green and along Fownes Street and Cope Street, creating a link between the key retail and tourist destinations of Grafton Street, College Green, Trinity College and Temple Bar. Central Plaza is part of an overall masterplan that includes adjoining properties 6-8 College Green, No. 9 College Green, and both the Annex and Commercial buildings on Dame Street. The 12,500 sq. ft office component of 6-8 College Green was pre-leased to Amtrust Financial last year, and who will begin occupying the space in Q3 2018. The 10,000 sq. ft ground floor retail unit in 6-8 will also be completed in Q3 2018 and the scaffolding on this building will be removed in the coming weeks. Hines has engaged BNP Paribas as letting agents of the retail and hospitality offering for Central Plaza and are attracting significant interest from major international and domestic retailers as well as food and beverage operators. Knight Frank are the office agents for the project.